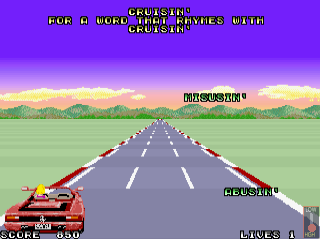 A word-based driving game for the original Out Run arcade hardware, developed for Wizard Jam 5 using the Out Run SDK. If pressing "1" doesn't work for you to start the game in your browser, you may need to reload the page or run the ROM locally. This seems to be a bug with having Emularity in an itch.io iframe. This game is designed and programmed to run in MAME 0.153 or higher. See the MAME installation instructions for your platform. 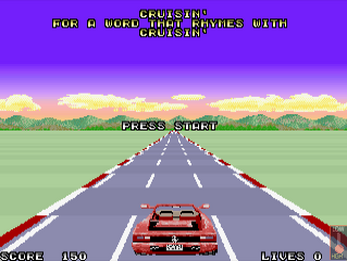 Unzip into your MAME install's ROM path for the "outrun" driver, e.g. 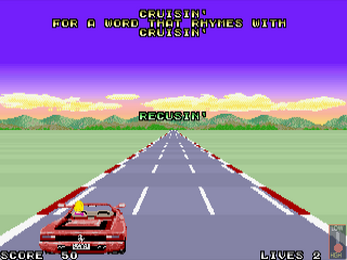 "roms/outrun/", and run with "mame outrun". Alternately, you can flash the EPROMs of a real Out Run board and run it on actual arcade hardware! Simple and fun! Nice job! Haha awesome! Yeah on my next play I ended seeing just about all my suggestions, too.